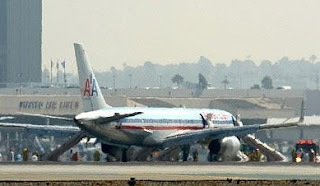 Passengers were evacuated by inflatable chutes Tuesday after a Honolulu-bound airliner made an emergency landing at Los Angeles International Airport because someone smelled smoke in the cabin. No sign of fire was found on the aircraft. Six passengers, including a child, were treated for bumps, bruises and other minor injuries, city fire spokesman Brian Humphrey said. American Airlines Flight 31 to Honolulu, carrying 188 passengers and six crew members, took off from the airport at 8:48 a.m., American spokesman Tim Smith said. A short time later, the pilot decided to turn back. "They had some type of smoke or odor in the cabin," Smith said. The Boeing 757 landed about 57 minutes later and "the captain elected to declare an emergency and get everybody out of the aircraft via the slides," Smith said. The passengers were to be placed on another plane to Hawaii but it was unclear how long they would have to wait, Smith said. Fire crews using thermal imaging cameras scanned the cabin and cargo hold "and thus far found no evidence of an active fire," Humphrey said. In another incident, an American Airlines jet made an emergency landing Monday at New York's Kennedy airport after one of the two engines lost power. Airline officials said there were no injuries. The MD-80 took off from LaGuardia Airport bound for Atlanta, but the crew immediately noticed they did not have full power, said American spokesman Tim Smith. "They powered it back, shut down the engine as they're trained to do, continued to fly on one engine and made a totally normal landing at JFK" Airport 20 minutes later, Smith said. Smith said engine debris found on the runway at LaGuardia and the engine will be examined to determine the cause of the failure. There were 139 passengers and a crew of five aboard the plane. About 80 were put on the next American flight to Atlanta, and the remaining passengers were booked on other airlines, Smith said. The MD-80 has two engines mounted on the rear of the plane. Like all twin-engine planes used in commercial aviation, it is designed to fly on one engine in case of failure, although that can make for a slower ascent. It was not clear when the American jet had its last major maintenance inspection. Smith said the engine failure was not related to the grounding of American's MD-80 fleet this spring to correct the packing of electrical wires.